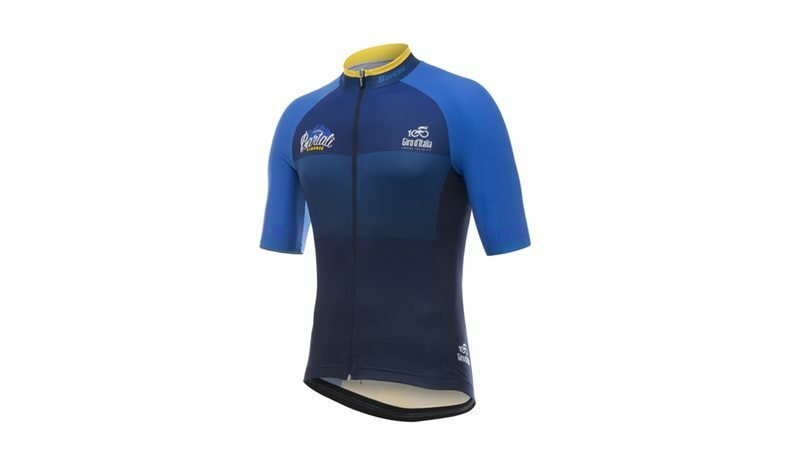 Santini Cycling Wear has been designing and making Giro d’Italia jerseys for over two decades; and alongside the signature pink Maglia Rosa and the jerseys for the leaders of the three other classifications, it is also launching a ‘capsule collection that pays homage to the four most iconic stages of the 2017 Centenary edition’. The jerseys are slim fit. The front and sides are made from a light, breathable fabric, ‘Think Opaco’, while stretch ‘Cyber Rider’ panels are used for the back for comfort and freedom of movement. The sleeves are in raw-cut ‘Bodyfit’ fabric. A silicon elastic gripper around the bottom hem stops the jersey riding up and helps it hug the body. Coordinating shorts, cap, socks and gloves are also available for each of the jerseys in the same colours and graphics. The Santini jersey dedicated to Sardinia, where the Giro starts, is in the colours of the Mediterranean Sea with a stylised traditional Sardinian lapwing interwoven with a swirling infinity symbol selected as the logo for the Giro d’Italia’s Centenary, on the back. Just above the lapwing are the names of the towns hosting the finish-lines of the three Sardinian stages. The 11th Bartali stage, will see the Giro pro cyclists tackle the Apennines starting from the Ponte a Ema in Forence, birthplace of the legendary Gino Bartali who won the Giro d’Italia three times and took the King of the Mountains jersey on no less than seven occasions. However, here the Santini jersey not only celebrates the latter’s cycling achievements but also his resistance work in the Second World War. Here, references to the great Italian cyclist and his life abound: the Bartali name is emblazoned on the breast topped by mountains crafted out of letters as Gino Bartali secretly carried letters during the War. The third jersey celebrates the Stelvio, which this year is also ‘Cima Coppi’ (Coppi Peak), a title bestowed each year on the highest peak in the race. Here, the Santini jersey includes the words W COPPI emblazoned on the front of the jersey, just as they appeared on the roads during the race. The jersey dedicated to the Giro d’Italia’s final stage, which takes the riders from the Monza Circuit to the Duomo in Milan, borrows the pinks and golds used for the Maglia Rosa. The Duomo itself is in profile on the breast just above the words ‘Monza – Milano’, which also crop up on the sleeves. The latter also sport the interlocking swirling zeroes logo chosen to represent the ‘Amore infinito’ slogan of this Centenary edition of the Giro d’Italia. The Maglia Nera or Black Jersey completes the Santini Giro d’Italia capsule collection. This is a reference to the legendary Maglia Nera awarded between 1946 and 1951 to the lowest ranked cyclist in the classification and ironically was greatly coveted with competitors even going so far as to puncture their own tyres to win it! The Santini 2017 Giro d’Italia capsule collection is available from leading cycling stores and the www.santinisms.it website.